This is the first in a three part series on the importance of recreational spaces in cities. These three short pieces about three different cities discuss the importance of play and relaxation spaces from three perspectives: first from the perspective of a father, then from the perspective of a mother, and finally, from the perspective of a grandmother. Visitors to Frenchman’s Bay spend time on nature trails, away from the pollution and noise of vehicular traffic. For many people in North America, the economy is still unstable and we worry about not being able to meet our financial obligations or support our families. Our only recourse seems to be continuous work. All of this is often and unfortunately supported by the culture of our societies and our physical spaces. We worry and we work. We ride overcrowded subways or sit in idling cars that pollute the air on congested highways. We are isolated even though some of us encounter hundreds of people every day. The hectic pace of life and unfriendly, unhealthy environments make us forget that each 24 hours is unique and that the world is full of beauty. Sometimes the anxiety becomes so great that we burn out. We have nothing left to give to the world. Our doctors prescribe to us antidepressants so that we can pull ourselves out of bed and numbly return to our daily routine. Taking a break does not appear to be an option. Yet, in all our hard work, I believe it is important that we have the freedom to stop, relax, play, and thus find balance in our hectic lives. If we are lucky, our cities maintain recreational spaces to support residents to slow down such as parks, playgrounds, sports facilities, hiking trails, and so on. There are several places where my wife and I take our children for an hour or two to unwind from modern life. Frenchman’s Bay in Pickering, Ontario, a city in the Greater Toronto Area, is a frequent destination for our journeys. We discovered the Bay on a spring day over a year ago by accident. We had just purchased clothes for our growing daughter, were in an adventurous mood, and decided to take a different turn than usual. Crossing over Highway 401 – a busy artery that connects the outskirts of Montreal, Quebec to Windsor-Detroit – and the accompanying railway tracks, we drove through a neighborhood of modest bungalows from the late nineteen-sixties and early nineteen-seventies. Porridge-colored brick homes with large living room windows and carports lined the road. As we headed south, countless tall deciduous trees with their broad green-leafed canopies appeared. The aroma of freshly trimmed grass wafted through my open window. My wife and I decided that this would be an ideal place to pull over into a parking bay and walk with our children. Birds sang mellifluously and, as we walked along, the architecture changed, revealing recently built white-board town-homes in which cafes, galleries and several psychologists’ offices operated. My son and daughter sat excitedly in their wide double stroller and turned their heads in every possible direction to absorb this wonderful place they were seeing for the first time in their lives. On a patio table, a group of women laughed. People of various ages were out on the sidewalk with us, walking unhurriedly. Many were enjoying conversations with their partners. As soon as we stepped onto a wooden pedestrian bridge, my children noticed the beach. On our left, the waters in a small inlet were calm and partially covered with a forest of gently swaying reeds. In a clearing a man in galoshes that stopped at his thighs waited for hungry fish to catch the tantalizing lure at the end of his fishing line. 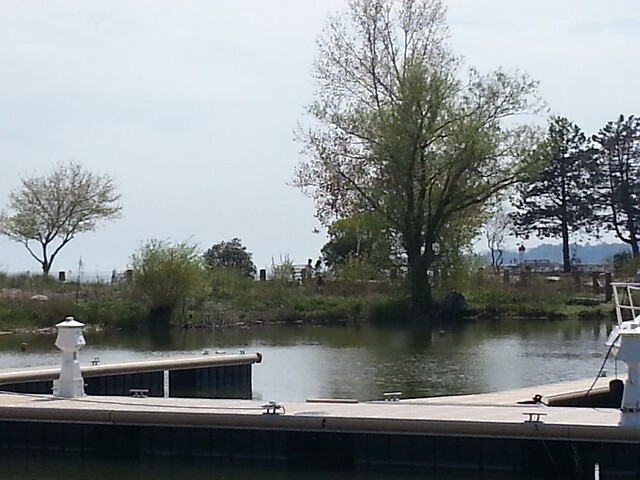 On our right, a small harbor with a maze of jetties waited for boating season to begin. Beyond it was Frenchman’s Bay with poplar groves, small rugged stone beaches, and water sedge. The waves charging in from Lake Ontario crashed loudly into the sand. We stopped to absorb the might of this watery wilderness. With more than six million busy people in the region around us, we were living in the moment, undisturbed by the cares of the world. 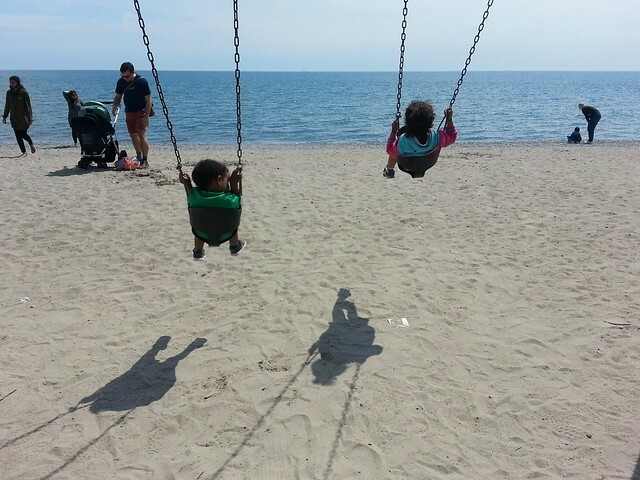 Children giggle with delight as they swing into the sky while facing Lake Ontario. A few hundred meters along the beach trail a colorful playground beckoned our entire family. It was time to swing, climb, and slide. Playing with our children in this space that was new to them and beautiful to all four us allowed our family, for a moment, to forget about life’s many complications. The journey off our normal path was well rewarded with this play and relaxation time. The combination of natural environment and well-placed amenities helped our family unwind together and for that I am truly grateful.